First up: We love the #unselfie campaign! A bit of background…as of last year, the Tuesday after Thanksgiving has been declared "Giving Tuesday," to change the focus from buying and acquiring on Black Friday and Cyber Monday, to giving back and thankfulness. (Fun fact, this was started by the folks at the 92Y in New York.) Meanwhile, the term "selfie" was chosen as the 2013 "word of the year." 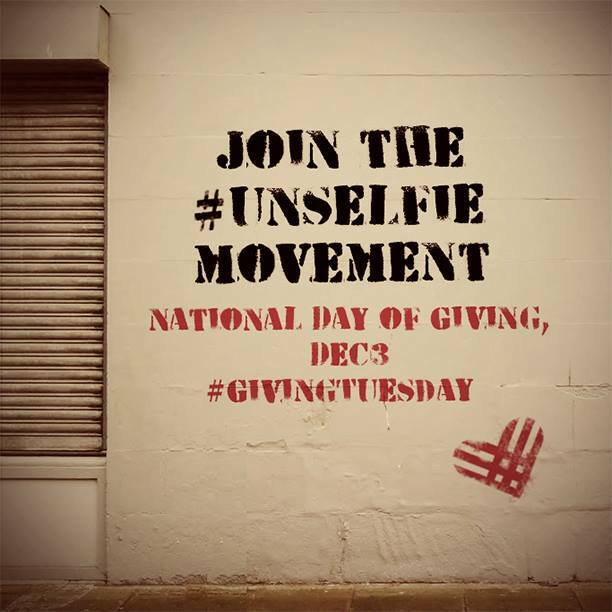 This year, Giving Tuesday added this cool #unselfie campaign, to get people taking pictures of themselves (or of their faces behind a sign they made) saying/showing what they're doing to give back. 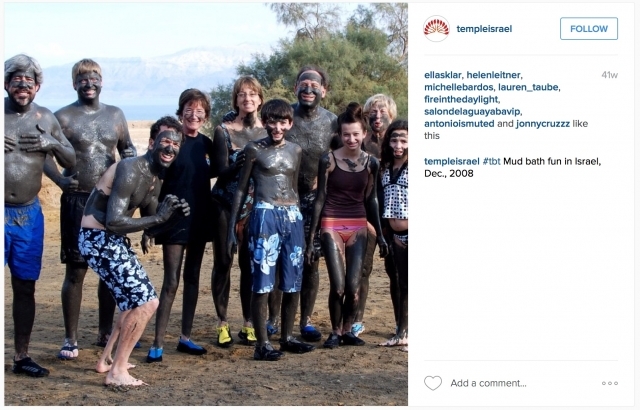 Taking and posting an #unselfie could be a great activity for a teen group, for a family to do together, for a synagogue staff to do as a group. 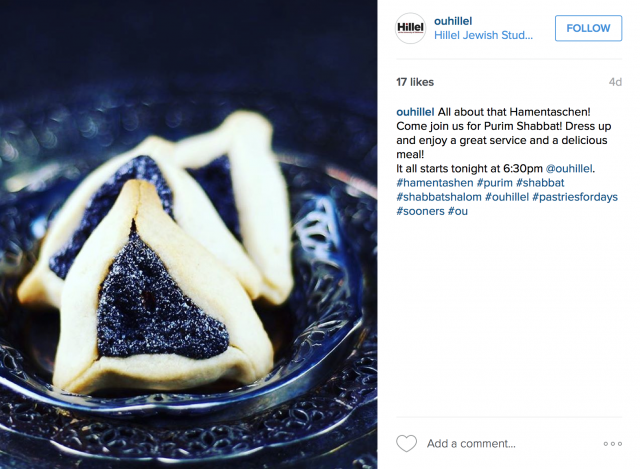 It's quick and fun activity to help share the light at Chanukah, and tap into a broader online campaign/conversation. And our next selection: Another great opportunity has come up for tomorrow, this one on the professional development side. The talented and vivacious Deborah Grayson Riegel is offering a free teleconference on giving effective feedback, Dec. 3rd, 2-3pm Eastern. Click here for details and to sign up. Finally: We've got one more example of a lovely campaign we wanted to share – Shira Kline, also known as Shirlala, is using the eight nights of Chanukah to run a "Be the Shamash" (the candle that lights all the other candles on the menorah) campaign. It's a great example of using your social media to highlight that sweet spot where the things you care about and the things that matter to your community come together and shine. Hosting these kinds of mini-campaigns on your Page, or through any social media outlet, helps keep you at the front of your community's mind. That way, when you're ready to tell them about an event or other offer, they're already listening. What have been your favorite things on the web recently? Share them in comments, or with Miriam through email, and they could appear here next week! Happy Chanukah, everyone! What are you thankful for this week? I'm thankful for this catchy Facebook post from Shannon Hall and her team at the Sarah & Irving Pitt Child Development Center of JCC Metro Detroit. 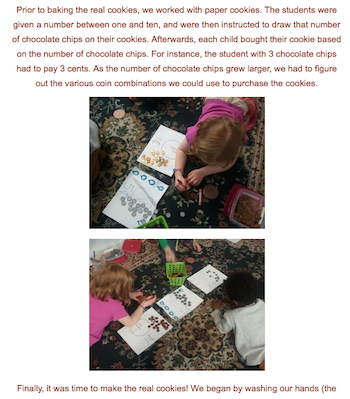 With the discovery that the most popular posts on their page were the photo collages, and knowing that the children would be focused on giving thanks in celebration of the upcoming Thanksgiving (and Chanukah!) holidays, the team developed this creative idea. Using smart phones, the team snapped a few photos of children, noted what they were thankful for, and added the speech bubbles using the free PicSay app for Android phones. For iPhone users, the free app Bubble works great, too. Then, in order to attract more attention then they would have by posting the photos individually, they collaged three responses into one photo using PicsArt, another free app for Android, iPhone users, check out the free and easy to use PicStitch. The result was a playful, eye catching photo. They combined with photo with an invitation to a week long game. Comment on the post and they'd ask your child next. And comment they did! Parents responded with curiosity about what their own child might say, and also added their own grateful comments. The result is a community expression of gratitude, perfect for the week before Thanksgiving. What was the strategy behind the team's thinking? As part of their work in this year's Jewish Early Childhood Social Media Academy organized by the Alliance for Jewish Education at the Jewish Federation of Detroit, the team wanted to celebrate the children and families within their preschool program in order get the word out to the larger community about their offerings. Their strategy is to encourage their current actively involved on Facebook parents to inspire others to join the fun. Focusing on organic, fun, and engaging posts, their Facebook page has been a model of successful early childhood engagement. In addition to achieving this immediate goal, creating social content that gets people to comment increases your "weight" in the Facebook algorithm. Your content is therefore more likely to show up in the newsfeeds of others who have liked the page, which leads to more engagement, which sets a very positive snowball in motion. 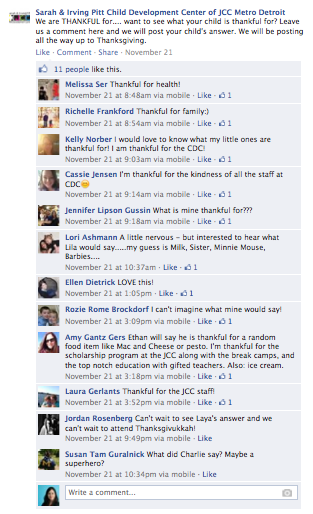 How are you stewarding a culture of thankfulness and engagement on your Facebook Page?